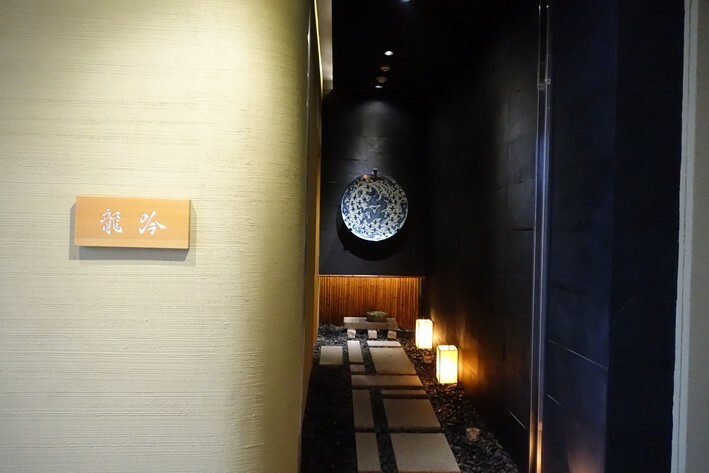 Ryugin opened in 2014, the sister of Ryugin in Tokyo. 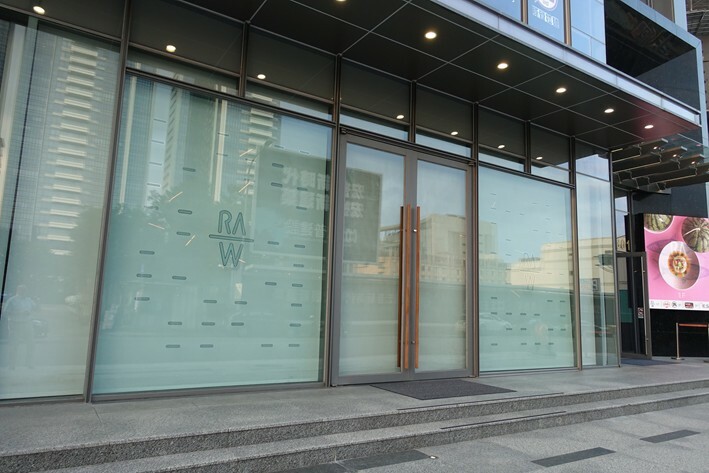 It is on the fifth floor of a modern office building. 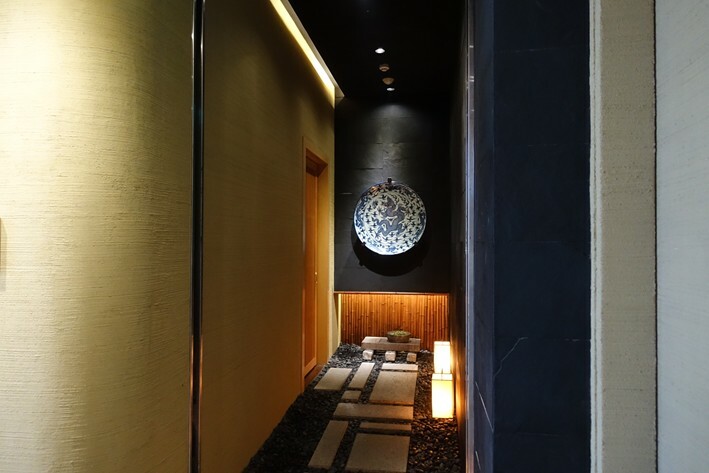 As you emerge from the lifts you see a very Japanese entrance, a path of stones lit by lanterns leading to a sliding wooden door. 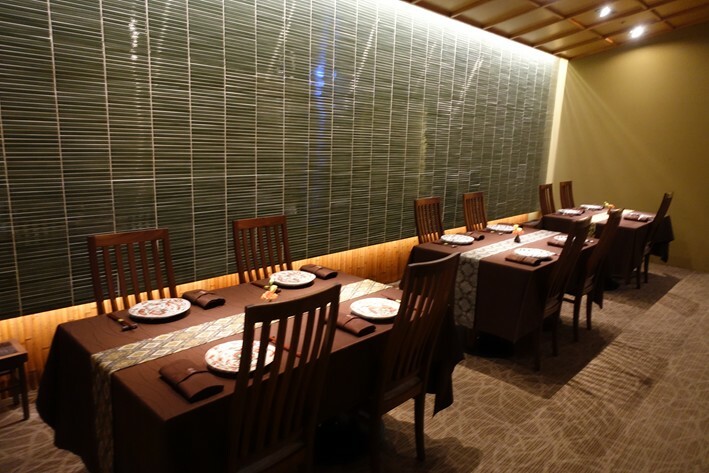 There is an initial lounge area that leads to a carpeted dining room with widely spaced tables. The menu is a no-choice tasting menu at TWD 4,200 (£107). The wine list was quite extensive, with labels such as Alphonse Mellot La Moussiere Blanc 2011 as at TWD 2,300 for a bottle that you can find in the high street for TWD 989, Domaine Weinbach Cuvée Catherine Riesling 2009 at TWD 4,000 compared to its retail price of TWD 2,885, and Prado Enea Gran Reserva 2005 at TWD 5,200 for a wine that will set you back TWD 2,185 in a shop. At the posh end of the list, Cos d’Estournel 2004 was TWD 12,000 compared to its retail price of TWD 4,658, and Antinori Solaia 2009 was TWD 19,000 for a wine whose current market value is TWD 7,667. There was also an extensive list of sakes. Chef Heida Ryohei worked for four years in Ryugin in Tokyo, and prior to moving here spent some time in the US training in restaurants including Manresa and Benu. 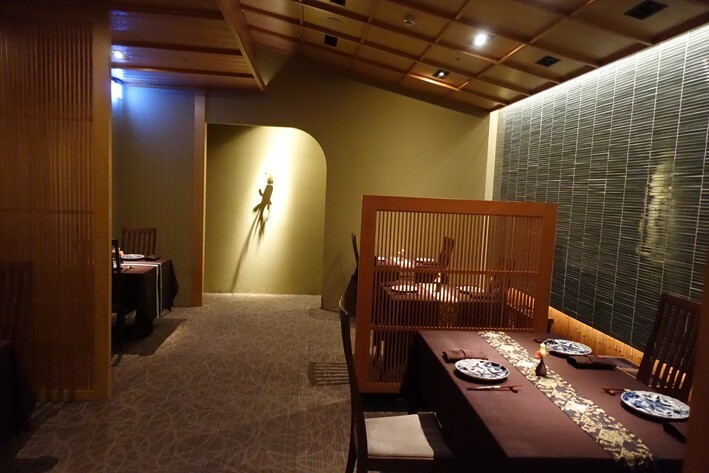 He has been given considerable latitude to create his own dishes, and in particular has made considerable effort to use local ingredients rather than just importing everything from Japan, which is what happens at Ryugin Hong Kong. I was told that around nine tenths of the ingredients used come from the island itself rather than Japan. 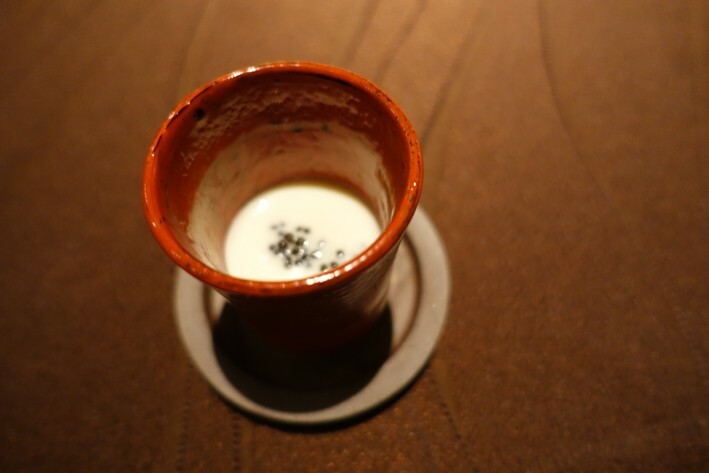 The meal began with a cup of cold soup, grilled corn with Taiwanese caviar. This tasted a lot better than it sounds, the slight sweetness of the grilled corn blending with the brininess of the caviar to bring a rich, savoury flavour (17/20). This was followed by a steamed egg custard coloured with squid ink, topped with mullet roe, tiny green beans and strips of grilled squid. 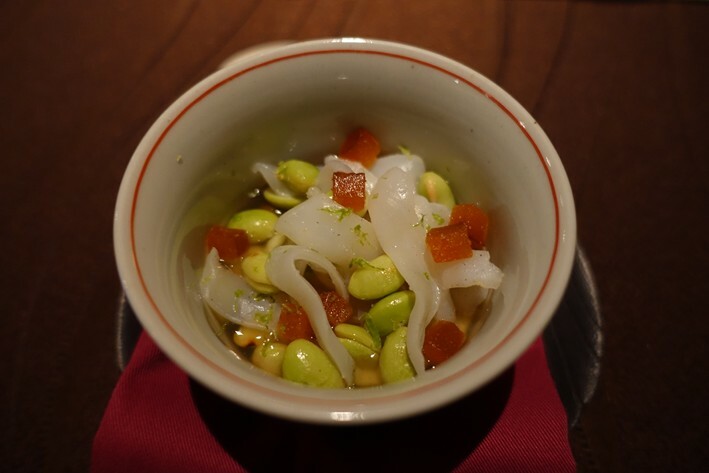 The ingredients were local, the squid from the northern coast of Taiwan, the beans grown on local farms. Variations on this dish, called chawanmushi, are endless in Japan. Here I particularly liked the little beans, which were tender and had excellent flavour, while the squid was good although not quite of the quality I have eaten at top places in Japan. The custard had very good texture though I am not sure what the squid ink really added (16/20). This was followed by an unusual dish. 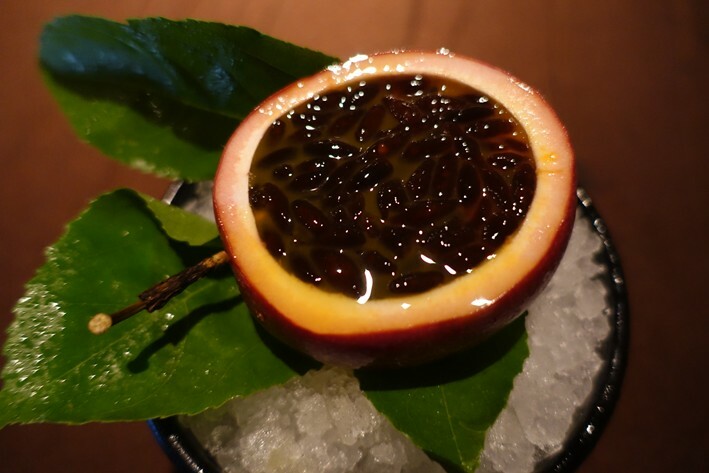 A Taiwanese fig had been cut open and filled with pine nuts and a miso sauce mixed with the fig pulp. 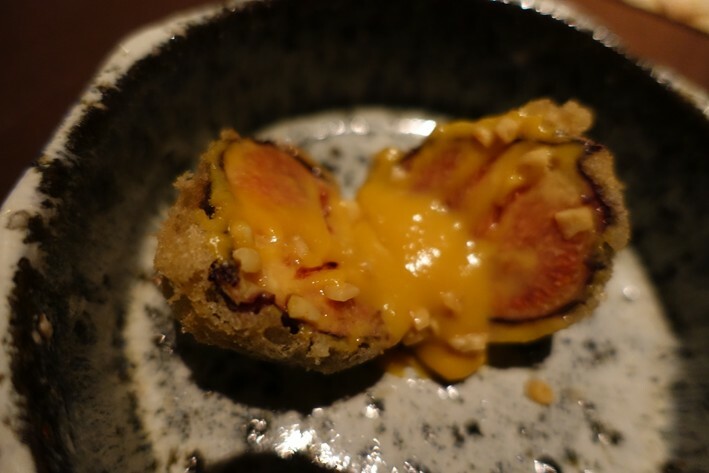 The fig was then reassembled and cooked as tempura. 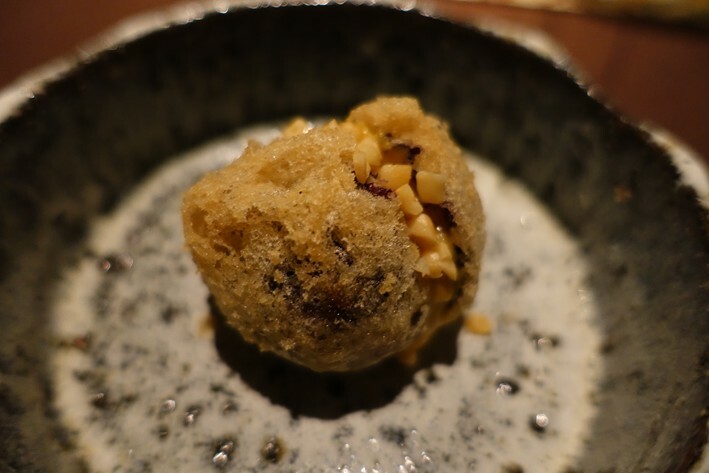 The outer layer of tempura batter was stunning, as feather light as you could imagine, and as you bit into the fig you tasted a lovely mix of the fig and pine nuts, the savoury miso flavour beautifully balancing the sweetness of the beautifully ripe fig. A fabulous dish (easily 19/20). Next was a mostly sashimi course. Sweet shrimp was exactly as it says, delicate with a distinct sweet flavour. 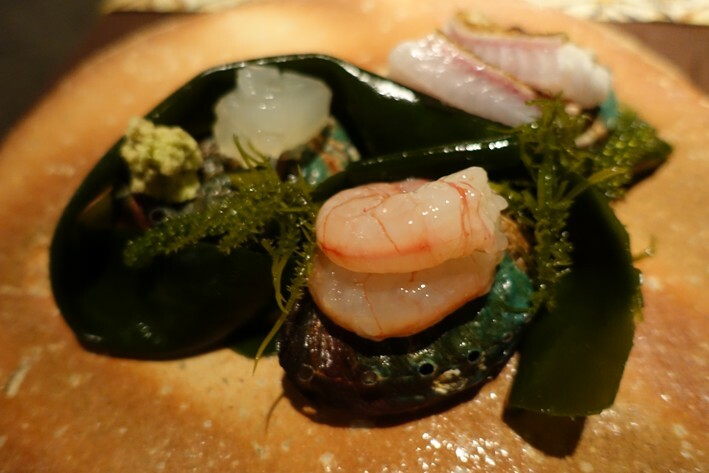 Japanese lobster came with wasabi, and the final element was grilled sea perch, lightly cooked with crisp skin. A soy and fruit vinegar sauce was offered for dipping. This was all attractively presented and allowed the excellent ingredients to speak for themselves (17/20). This was followed by Taiwanese freshwater eel grilled with salt and having crisp skin, served with a rich sauce made from the eel bones along with rice wine and soy. There was also a deep fried eel bone, which reminded me of pork crackling in its crunchy texture, and a little freshly grated wasabi. 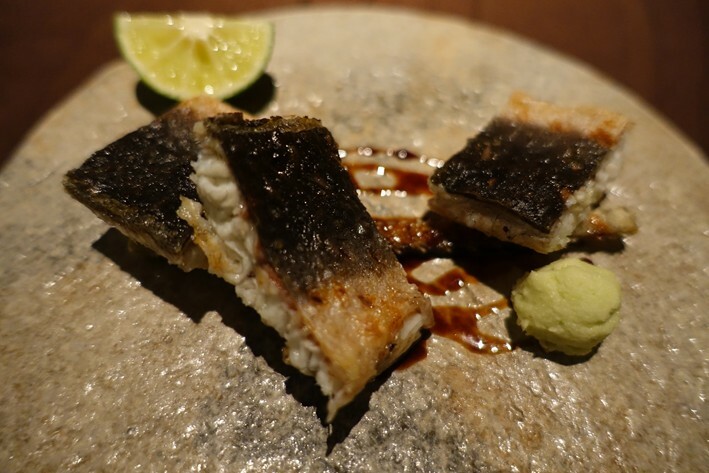 The eel had lovely flavour and the sauce was gorgeous, the deep fried eel bone an interesting textural contrast (18/20). Next was ox tongue soup with radish and magao, a Taiwanese spice from an evergreen tree that had a lemony, peppery taste. 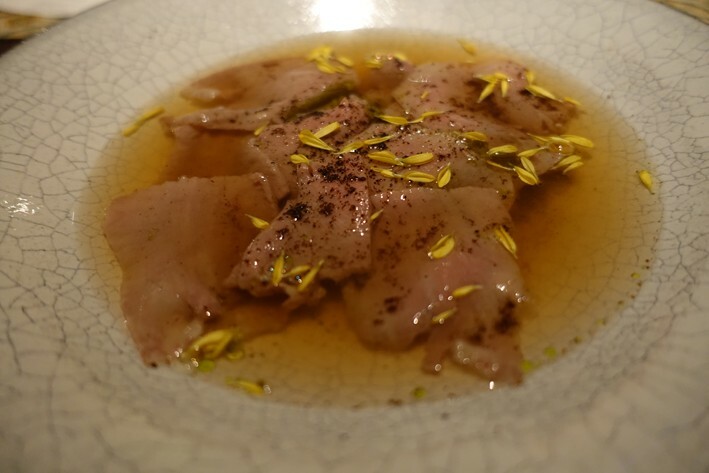 This was completed by green onion oil, the radish having been cooked in kombu (edible kelp) and the ox tongue sliced thin and rendered tender by slow cooking for twenty four hours. The ox tongue was certainly far from the chewy horror that sometimes turns up on plates in England, this being as delicate as you could wish, and the pepper managed to lift the flavour well. 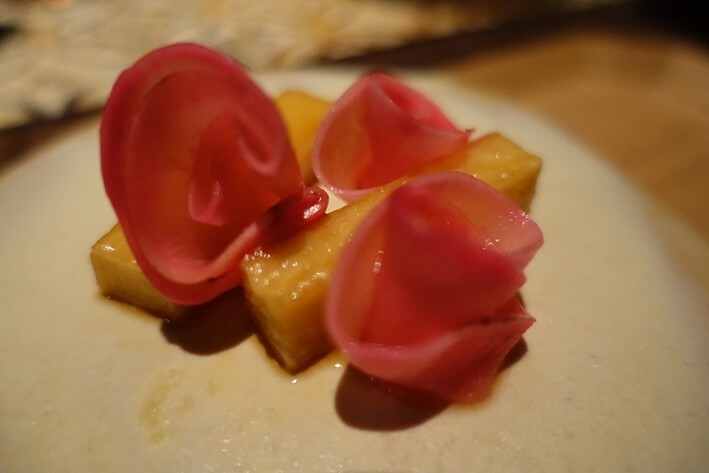 However I think there are limits to how good ox tongue and radish can ever really taste, an impressive transformation of unpromising ingredients though this was (16/20). 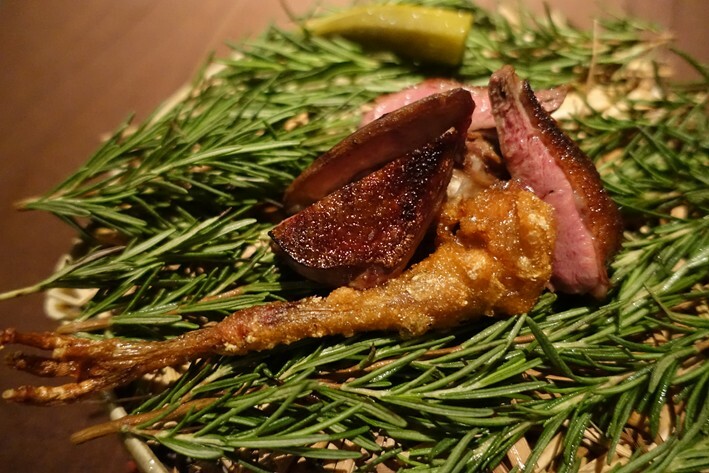 The final savoury course was squab pigeon from central Taiwan, served on a bed of rosemary. Under the carcass of the bird was a piece of charcoal, the breast having been charcoal grilled and the leg having been deep fried. Finally there was some pickled okra to cut through the richness of the meat. The pigeon itself had superb flavour and was beautifully cooked, and the scent of rosemary and the smoky note from the charcoal was intoxicating. This was an absolutely fabulous dish (20/20). 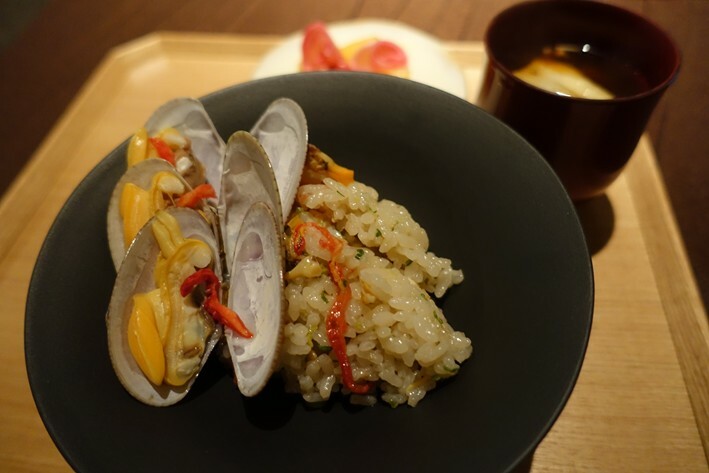 As is traditional in a kaiseki meal, the savoury section was concluded with a bowl of rice and pickles. 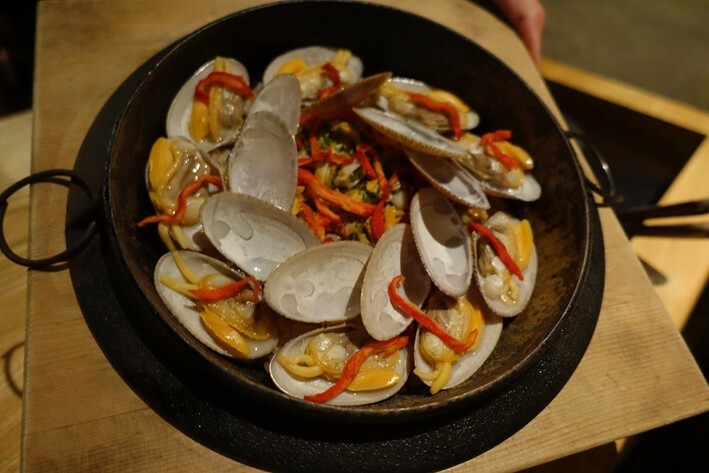 Here it was enlivened by serving something closer to a paella, with clams, green onion and tomato. The rice was japonica but actually grown in Taiwan, and the pickles were lovely. 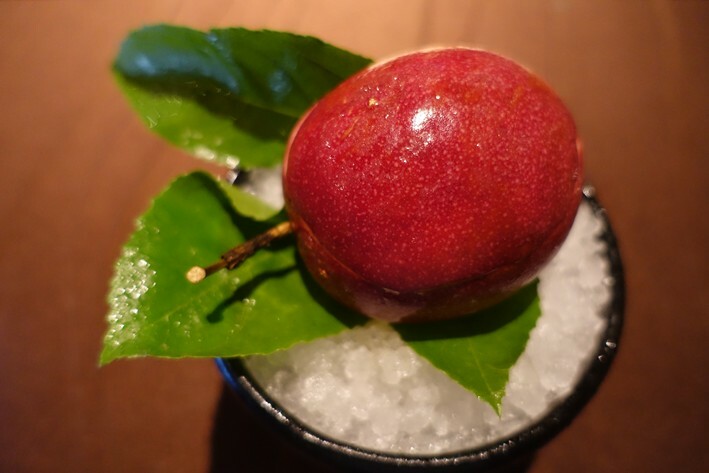 Many Japanese restaurants end a meal with a piece of fruit, but Ryugin has always been a restaurant to be more ambitious when it comes to dessert. 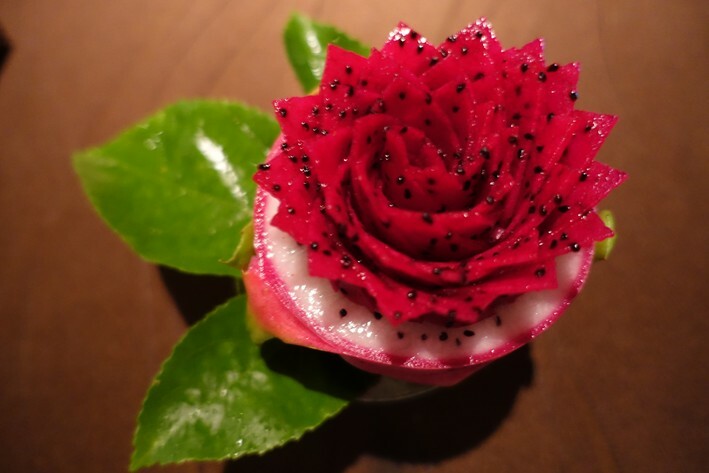 Dragon fruit from Taiwan was arranged to look like a rose petal, coated with sugar water cooked with ginger. Underneath the dragon fruit petal was a filling of lemon sorbet and pear. The sorbet was glorious, and the hint of ginger added an interesting extra flavour, the sugar water bringing balance to the sharpness of the fruit. This tasted fantastic, quite apart from the technical wizardry required to achieve this attractive presentation (19/20). Next was a hollowed out passion fruit. As you opened it there was a top layer that looked like passion fruit seeds but was actually tapioca, and underneath this was a classic creme brûlée. This was another gorgeous dessert, the creme brûlée itself classy, the remains of the passion fruit bringing some acidity to balance the tapioca. This was another dish which was very clever but which tasted every bit as good as it looked (19/20). Service was superb, my waiter able to discuss the sourcing of ingredients and how each dish was prepared in detail. The bill came to TWD 8,140 (£207) with some glasses of very good wine to drink, including a delightful 2012 Chapoutier Sizeranne, which despite being a Syrah had the subtlety of a Burgundy. This was a superb meal, and wildly, dramatically, massively better than the other two multi-starred restaurants in Taipei this year, Le Palais and The Guest House. 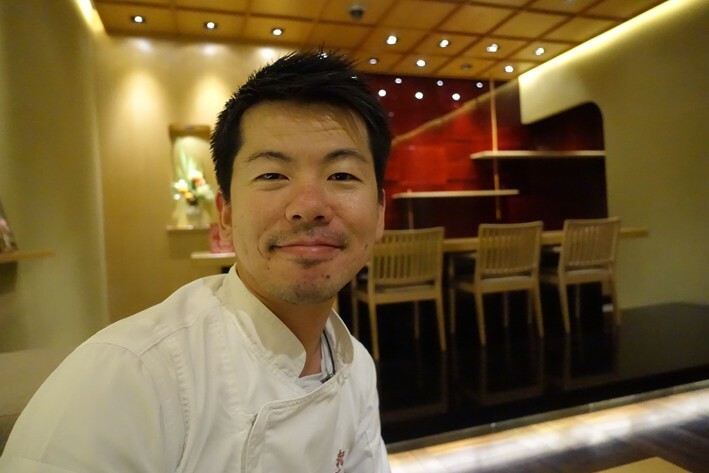 The chef is taking risks by relying on local ingredients when he has his pick of the best ingredients on earth in Japan. Yet the pigeon dish for example shows how this local bird can be conjured into a dazzling dish. Not every dish was quite to that level, but this was a very fine meal indeed, with some remarkable highlights. This is the best food I ate on this trip to Taiwan by a country mile.